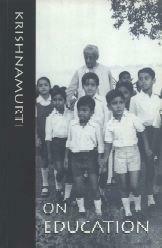 This ebook On Education is the outcome of talks and discussions held in India by J. Krishnamurti with the students and teachers of schools at Rishi Valley School in Andhra Pradesh and Rajghat School at Varanasi. These centres are run by the Krishnamurti Foundation India, which was set up to create a milieu where the teachings of Krishnamurti could be communicated to the child. Krishnamurti regards education as of prime significance in the communication of that which is central to the transformation of the human mind and the creation of a new culture.